Side-bar story to "Cannibalism  Eyewitness accounts from inside the booming trade in fetal body parts"
This article is a side-bar story to Cannibalism  Eyewitness accounts from inside the booming trade in fetal body parts, the cover story of the August 23, 1999 issues of the Alberta Report. A full-colour, glossy brochure invites abortionists to "find out how you can turn your patient's decision into something wonderful." It is printed by Opening Lines, A Division of Consultative and Diagnostic Pathology. Inc., a wholesale trafficker in fetal parts from American clinics. Working out of an office in West Frankfort, Illinois, the company's director, Dr. Miles Jones, profits from a tremendously lucrative trade. His current "Fee for Services Schedule" offers eyes and ears for $75 and brains for a mere $999. Opening Lines was founded in 1989 to "maximize the utilization of fresh fetal tissue we process." It offer researchers "the highest quality, most affordable, and freshest tissue prepared to your specifications and delivered in the quantities you need when you need it." The sale of human tissue, including fetal tissue, is against federal law, but Opening Lines advises patients how "simple" it is to get around that. It offers to "lease space from your facility to perform the harvesting...to offset your clinic's overhead." It also offers to train clinic staff in harvesting and then, "based on volume, reimburse part or all of your Employee's salary, thereby reducing your overhead." Dr. Jones is obviously adept at getting around inconvenient regulations. "We do not require a copy of your IRB approval or summary of your research" he advises prospective clientele, "and you are not required to cite Opening Lines as the source of tissue when you publish your work (we believe in word of mouth advertising: if you like our service you will tell your colleagues)." Opening Lines is one of two wholesale fetal-parts traffickers uncovered by Mark Crutcher of Life Dynamics Inc. The other is the Anatomic Gift Foundation (AGF). Founded in 1994 by Jim and Brenda Bardsley, it originally operated out of a double-wide trailer at the end of a dirt road on the Satilla River in Georgia, where the couple also ran a catfish farm. It has since moved its headquarters to Laurel, Maryland, and now has branch offices in Phoenix, Arizona and Aurora, Colorado. 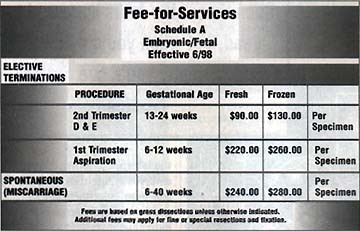 Life Dynamics' sources inside abortion clinics acquired "fee schedules" for both organizations. Opening Lines' is the more detailed of the two. An "intact trunk (with/without limbs)" costs $500: a liver is $50, but there is a "30% discount if significantly fragmented". 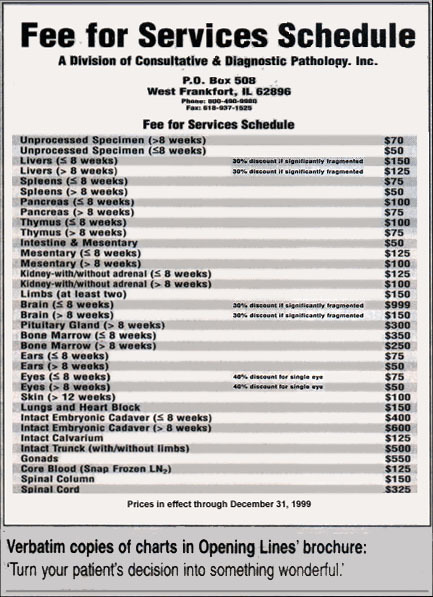 The prices "in effect until December 31, 1999" may seem low, observes Mr. Crutcher, but add up all the parts, and [a] single aborted baby is worth thousands. "Our daily average case volume exceeds 1,500 and we serve clinics across the United States" says Opening Lines' brochure.